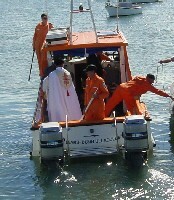 The Easter weekend in Ulladulla sees the annual blessing of the fleet. Ulladulla is not a big harbour but there is a fishing fleet based there and the town has some of its cultural roots (certainly in it’s fishing industry) in Italian culture. The result is the Catholic Church and the Fishing Fleet getting together for the Blessing of the Fleet. The three days that this occurs over sees Ulladulla turned over to parades, firework displays, fêtes, carnivals, markets and the all important blessing of the fleet itself. This is the first time I have been here for it (whilst the family made it last year, I was in India at the time and therefore missed it). This year, however, the parade had been cancelled. Presumably this was a result of the increased public liability insurance charged by New South Wales Insurance Companies. The first thing you notice in this period in Ulladulla is the swelling population of the town. All accommodation in Ulladulla, Mollymook and Milton has been booked out for some time and trying to park in town on Thursday afternoon or on Good Friday, Saturday, Easter Sunday or Monday is almost impossible. Pretty much all the shops open over the period, and at places like the Marlin, where the week before you could go in and enjoy a beer listening to the DJ, over the Blessing of the Fleet period, you have to queue to get in, and then pay $5.00 to listen to the same DJ you listened to the week before for free. Still, it is a lovely time around town. The carnival, the boats, the food and the atmosphere all combine to make the day memorable. I must admit to a couple of things that made the Blessing of the Fleet in 2003 even more interesting for me. I guess that if you went to any carnival anywhere in Australia, the entertainment provided would be a rock band, or a folk singer singing old Australian songs, or something similar. 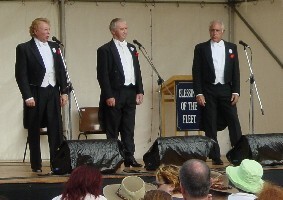 At the Blessing of the Fleet, we had three very good tenors (and I will spare you all the thirty dollar jokes here) accompanied by a keyboard player singing the more well know Italian, Russian and German operatic type pieces. So, for example, we heard La Dolce Vita, Amore and such. This gave the whole day a somewhat more Mediterranean feel than I thought possible in Australia. Walking around in the sunshine, enjoying the day, eating sausage sandwiches and listening to three tenors really belting out a number – what could be better? The day also confirmed in my head something that I had not really noticed before. Man has built machines – and steam engines (stationery or train) were amongst the earliest. However, of all the machines that we have built, steam trains are about the only ones that I can think of that can be expressed really well in music. To give the tenors a break, we had a pommie with his harmonica and he played a steam train or two during his performance. 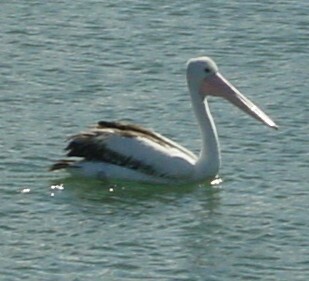 And hey, the Pelican may look like he us only having an ordinary time but if you are looking for something to do around Easter next year, head down to the blessing of the fleet in Ulladulla.